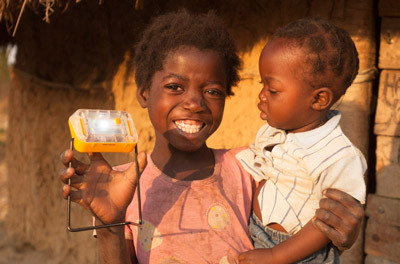 SolarAid is extremely proud to have launched ‘the world’s most affordable solar light’. After years in development, this little light, called the SM100, is now being distributed across Africa via our social enterprise, SunnyMoney. The SM100, developed for SolarAid in conjunction with Yingli Solar and UK industrial design firm inventid, incorporates feedback collected from SolarAid’s decade of experience of selling solar in Africa and has now been trialled in Malawi, Uganda and Tanzania, with extremely positive feedback. The SM100 sells for just $5 in rural Africa, when governments do not tax tax its import unreasonably. The upfront cost of solar lights is the key factor which stops households switching from dangerous and toxic kerosene to renewably powered solar lighting so the reduction in price the SM100 has achieved has made solar far more accessible. 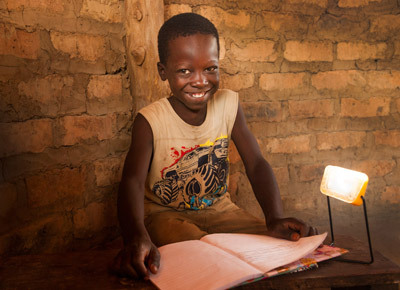 SunnyMoney’s Sales Agents are now telling us that many more families are able to buy their first solar light. The solar powered light can be charged in extremely low light conditions and provides more than 5 hours of bright light. It can be used as a traditional desk light, a torch or hung on the wall. Due to the SM100’s rectangular shape it can be also be used off the stand and additional slots in the casing can be used to attach a strap so that the lamp can be worn as a head torch for hands-free use. Check out the SM100 on TreeHugger and Inhabitat and read about how it’s being used in Zambia, Uganda and watch the video of it in Malawi. The SM100 retails for £10 in the UK, providing SolarAid with additional funds to help distribute more SM100 lights in Africa. You can buy the SM100 in our online shop. 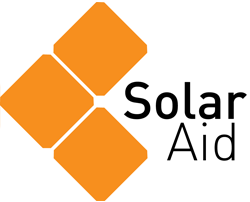 SolarAid is now working to find more ways to get this new, more affordable solar light to the people that need it most and are keen to partner with other organisations that work on development projects where the light could help and to distribute products to people at the ‘base of the pyramid’ across Africa and the rest of the world. If you can think of any ways to increase the uptake of the SM100, or other organisations we could partner with, please let us know. Together we can eradicate kerosene for good and provide clean, renewable energy to everyone. In some territories of some African countries, via some sales channels, it is now possible to buy other Lighting Global Certified solar lights for less than the SM100. SolarAid is pleased to have held the title of “world’s most affordable light” but recognise there are now other affordable solar lights. The more affordable our industry’s products become, the more African people will be able to afford them.